Let’s now come to the questions you framed. Why Dakshinamurthi facing South direction? Are there any specialties in south direction suggested in Agamas and in Shilpa Sastras? ‘Kuragasanam’ is one of the type of Asanas? Why there are such different types of Dakshinamurthi in South Indian temples? In North India, we can’t see the Dakshinamurthi idol… Why it is so? In your sixth chapter, I saw a Dakshinamurthi photo. It is very different. Can you tell me from where it is? A. Why Dakshinamurthi facing South direction? 1.1. The direction towards which a temple-deity faces depends upon its disposition and attributes. It also is according to this triple orientation – towards the Sun, towards the center, towards man. The majority of the preserved temples do face the east, but it is not necessary that they physically must. The other directions could be described as being east. To the tantrics that have some obscure symbolism about Sunrise in the east, the directions of south, west and north each have relative value or significance. In Tantra, any direction may notionally be taken to represent east. 2.1. As regards Sri Dakshinamurthy, as you mentioned, he most usually faces the South (except perhaps in few cases such as in the temple at Tiru Anjaikkalam in Kerala where Sri Dakshinamurthy faces east). The south-orientation of Sri Dakshinamurthy appears to be based on the notion that he is seated in the Himalayas looking towards the land-mass where the aspirants reside; that is towards south. 2.2. 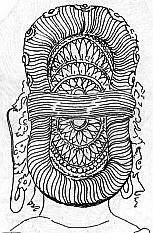 Another way of understanding it is; Suta –samhita describes the five faces or five aspects of Shiva which are turned towards four cardinal directions and the space above, as: on the West: Sadyojata (representing earth, and pervading ego); on the North: Vamadeva (water and manas); on the South: Aghora (fire and Buddhi); on the East: Tatpurusha (air and maya); and above all: Isana (akasha and soul). The South face of Shiva is Aghora . It is to your right-hand-side (Dakshina) as you stand facing the Linga of Shiva. Aghora (that which is not dreadful) is the benevolent, benign face of Shiva; and it is directly related to Vidya (the knowledge that liberates) and then to fire (illumination) according to Vatulagama (1.67-69). Aghora the benevolent is predominantly of sattva nature with minimal of rajas and tamas. It is a state of pure being and energy. It is pure knowledge (para-vidya); and, Sri Dakshinamurthy represents that knowledge. Sri Dakshinamurthy who corresponds to Aghora the south aspect of Shiva is therefore represented facing south. 3.1. Another, perhaps more plausible, reason could be the one that has to do with the nature and disposition of Sri Dakshinamurthy. According to the Padma-samhita (kriya-pada 2, 33-34) the door of the sanctum facing east is productive of happiness; the door facing the west enhances health and nourishment; the door facing north brings wealth and prosperity; and the sanctum door facing south makes for liberation. Since Sri Dakshinamurthy, the Adi-Guru, teaches knowledge (jnana-karaka) that liberates (mokshadam) it seems appropriate he faces south, according to Padma samhita. 4.1. It is mentioned repeatedly that he is called Dakshinamurthy because he is facing south.And also because the deity is placed in the southern quarter of the temple .Some say ; the name of the deity may have been derived because of this practice. However, there are few other explanations too. 4.2. According to Tantra tradition in which Sri Dakshinamurthy is a revered Guru of the Kadi (samaya) School, the term Dakshina means a woman and refers to the feminine principle, which can create, unfold and manifest. When Dakshina assumes a form along with Shiva it results in Dakshinamurthy, an androgynous aspect of Shiva. 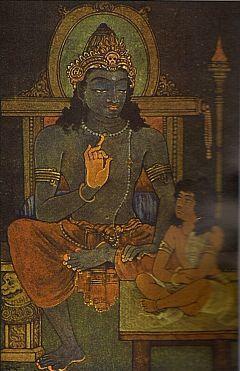 The Tantra tradition Dakshinachara regards and worships Sri Dakshinamurthy as Ardha-nari. 4.3. The great seer Sri Ramana Maharishi who perhaps is closest to Sri Dakshinamurthy in his ideals and in his teaching methods, explained the term as Dakshina + Amurthy, meaning a formless entity, one which is capable but is without form. Dakshina refers to He, who is competent to create, sustain, and dissolve this Universe; and, who, however, in reality, in his Absolute state, is A-murthy i.e. formless. 4.5. He is called Dakshinamurthy because of his boundless compassion (Dakshinya) towards all creation. 4.6.Dakshina , it is said , also means favourable (anukula ) to the devotee. 4.7. Dakshina is also interpreted as grace. Sri Dakshinamurthy is regarded the very embodiment of grace . It is explained that ‘grace’ (anugraha) is an act of unbound compassion releasing the individual from the coils of samsara. As Guru, he is the sublime ideal of spiritual wisdom adorned with grace towards all aspirants. And, only through his grace can one attain liberation. 4.7. And, It is also mentioned that the term ‘daksha’ denotes one who is capable, skilful or an expert. 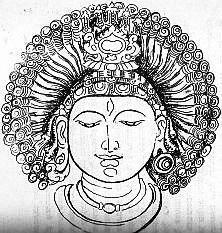 Daksha also signifies the intelligent or competent. Dakshinamurthy is the Daksha, the Master in music, arts and in all that is accomplished artistically; an exponent, an authority on scriptural learning; an adept in Tantra-vidya; a supreme Yogi; and, a teacher beyond compare who teaches the true knowledge that liberates. C. Are there any specialities in south direction suggested in Agamas and in Shilpa Sastras? 5.1. Orientation is an essential aspect of the yajna and construction of the yajna vedi, the temples, the towns and buildings. Meticulous care is taken to ensure location of those constructions exactly along the desired axis (Prachi). That was because of the belief that each direction was complimented by the attributes associated with the gods who presided over it. The directions were therefore of much significance to the Vedic people. 5.3. Since we are talking about the south direction in particular, let’s take a look at it. In the context of the yajna, the Southern gate is reckoned as the way of the ancestors the pitris; and, the offerings to the departed ancestors are always submitted facing South. Yama is the Regent and protector of the South. Yama the lord of death is depicted as the embodiment of righteousness, the Dharma; and he is the king of justice, the Dharma raja. He judges the dead; but, he is amenable to pity and reason, as it happened in the case of Savitri and Pramadvara* in the Mahabharata. Sri Dakshinamurthy too was an adept in Atma-vidya. (I am not suggesting a connection). D. Kuragasanam’ is one of the types of Asanas? 6.1. 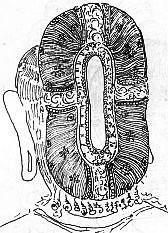 The Shilpa texts (Ahirbudhnya samhita and others) together describe as many as twenty asanas or sitting postures. They also describe about eleven types of seats or pedestals, also termed as asanas, on which the iconic representations are lodged. The Kuragasana you mentioned is in fact Kurangasana. It merely refers to the fact that Sri Dakshinamurthy is seated on a throne or pedestal or a seat covered with deer-skin. Kuranga, in Sanskrit, refers to Indian antelope. In Poet Jayadeva’s celestial poem Gita Govinda, Sri Radha covered in the fragrance of Kasturi (deer’s fat or musk) is described as kuranga madena . And, in the Sharada Bhujanga stotra , Goddess Sharada is described as one who rides a deer (kuranga). Please click here for Sanskrit -English Dictionary , (page 65) where Kuranga is explained as a musk deer. 7.1. Providing elaborate, graceful and attractive hairstyles (Kesha vinyasa or kesha-alankara), which besides enhancing the beauty of the sculpture would also bring out the status, the nature and the attribute of the subject, received a great deal of attention. This was one area along with ornamentation (alamkara) where the shilpis could give wings to their imagination and enterprise; and exhibit originality. Some Shipa texts carry a chapter usually titled Mauli lakshanam, but there is no comprehensive list of hair styles. Some names are not supported by illustrations; and therefore we do not know what those style-names imply. And in some cases the names of the headgears (kirita or mukuta) have got mixed up with the names of hair styles. The following are some of those Kesha – vinyasas, so far as I know .This is not exhaustive. (8) Kesha –Bandha: The strands of hair are neatly combed and arranged into various conical forms of a series of diminishing tiers and placed in position by tying up the arrangement securely. There are varieties of decorative and stylish hair arrangements under this category. In most cases the conical hair-do is arranged to look like a mounted crown and decorated with ornaments. There are countless variations. (Devis and Queens). [Bharata in his Natyashastra (Chapter 21) while dealing with Pravrtti (local manners and costumes) mentions, among other things, : the women representing characters from Avanthika region should be adorned with curly locks; and those from the Gauda-desha with long hair. 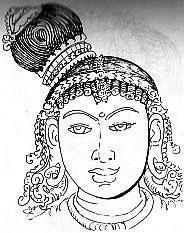 The Panchala, Magadhi and Dakshinatya are to have only a braid of hair. The Kerala beauties should be adorned with long curly locks. As regards the Abhira tribal girls, their hair is to be divided into two plaits. The wives of the sages as also those women away from their husbands should be shown with hair braided in single lock. F. Why there are such different types of Dakshinamurthi in South Indian temples? 8.1. We discussed in fair detail the variations in the depictions of Sri Dakshinamurthy image. Well…the aspect of the divinity one chooses to worship depends on one’s needs and aspirations. As you noticed, the Vyakhyana, medha – Jnana versions and their combinations appear to be popular .They are worshipped praying for scriptural knowledge, intelligence and spiritual progress. G. in North India, we can’t see the Dakshinamurthi idol… Why it is so? 9.1. I agree, Sri Dakshinamurthy shrines are more in number in the South. But, Sri Dakshinamurthy is worshipped even in the North; and there are some temples dedicated to him. As we already saw, Sri Dakshinamurthy is worshiped in Linga form at the Shiva temples in Kathmandu (Nepal) and in Ujjain. I understand there is an old temple dedicated to Sri Dakshinamurthy in Varodra. 9.2. Shri Dakshinamurti Pitha (Varanasi), with the temple of the deity, is an ancient one. Its history goes back to about the tenth century. The Math is still in active service and the worship continues. 9.4. The noted scholar Shri TA Gopinatha Rao in his book Elements of Hindu iconography (p 273 vol. 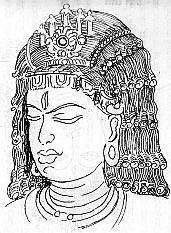 2, First edition, 1914) identified a niche figure in the temple of early sixth century at Deogarh MP as Daksinamurti. 9.5. The worship of Sri Dakshinamurthy perhaps travelled along with the Indian traders of 10th– 11th century to Far East. The Phnam Rung Siva temple, Pimay , a Khmer temple complex built during 10th to 13th century in North east Thailand, has a panel depicting Sri Dakshinamurthy in a teaching posture. 9.6. For some reason, the shrines of Sri Dakshinamurthy are not many in North India. I am sorry, I am not aware of its precise reason. H. In your sixth chapter, I saw a Dakshinamurthi photo. It is very different. Can you tell me from where it is? 10.1. I presume, you are referring to the following picture. It is a creation of Shilpi Siddanthi Sri Siddalinga Swamiji of Mysore. He crafted the image in the early stages of career while he about twenty years of age (1903?). I understand the image is located in the caves of the Sri Shambulingeshwara Hills (Chilakawadi Betta) near Chamarajanagar. 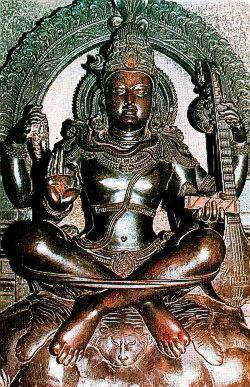 Sri Dakshinamurthy is depicted seated in Yoga in utkutikasana with both the legs drawn up on to the seat , bent and crossed like scissors and held in position by paada-patta or Yoga –patta (as in Yoga Narasimha) which passes round the legs and the body , The four armed figure is holding akshamala in upper-right-hand; veena in upper-left-hand (he is just holding it , but not playing on it ); a palm- leaf text in the lower-left-hand ; and gesturing vyakhyana mudra in the lower-right –hand. A prabhavali is placed behind the figure of Sri Dakshinamurthy. It looks different, as you said, because it is a combination of three aspects of Sri Dakshinamurthy: the Yoga-murti, the Vina-dhara and the vyakhyana-murthi. It is Yoga because it is sitting in yogic posture; vina-dhara because it is holding in its back left hand a veena; and it is vyakhyana-murthi because its front right hand is in vyakhyana-mudra, while its front left hand is holding a text. It is said; the full view of the sculpture reveals that the deity is sitting under a banyan tree; the figures of six Rishis are carved on the lower portion of the pedestal; and Nandi with four arms and human body is standing besides the Rishis. The sculpture, it appears, was inspired by a similar depiction placed in a niche at the Shiva temple in Nanjangudu ; and , by an illustration in Sritattvanidhi of Sri Krishnaraja Wodeyar III the then Maharajah of Mysore (1794-1868). I trust this might be of some use to you . Please also check the references/links I provided. I wish you Godspeed in your project and in all your endeavors. Regards. In many places, I have read about 21 important temples of Lord Dakshinamoorthy…could you please list the same. Dear Thisisvi, Temples where Dakshinamurthy is the chief deity are small in number. Generally, in Chola temples- both of Shiva and Vishnu- a niche in the south wall of the central shrine holds the image of Sri Dakshinamurthy. In all those temples the idol of Sri Dakshinamurthy is either carved on the wall; or placed in a niche or in a small shrine. Many temple towers too carry various versions of Sri Dakshinamurthy image. Sri Dakshinamurthy forms are immensely diversified; there are too many versions of his form. There are too many temples to be listed. However, my friend Smt Ushasuryamani had earlier made a list of Sri Dakshinamurthy idols she visited during her pilgrimages. I am reproducing extract from list. Trust this might help.This exhaustive ; but not complete. : At Agaram 12 kilometres from Kanchi on the kanchi-Arakonam road. ( This is called Govindavadi) Sri Dakshinamoorthy is worshipped as Guru here. A separate Temple with very interesting Features. : At SuruttappaLLi one can see Shree Dakshinamoorthy as Koshta Devatha with His Consort…something unusual. He is called Daampathya Dakshinamoorthy. : At Puliyarai near Thenkasi, Zodiac signs are supposed be there in front of Him. :At Punjai near Semponaar koil, Naagai district, Most beautiful Dakshinamoorthy red in colour. : At Thirunaavalur near Panrutti…Sri Dakshinamoorthy standing with the Rishabha. :At Lalgudi, Sri Saptharisheeswarar Koil..Veena Dakshinamoorthy. : At Thiruppunnavasal…5 1/2 feet tall Lord Dakshinamoorthy. : At Omaampuliyur near Kaattumannarkoil…Not only is He a Koshta Devatha..He is between Siva & Ambal Sannidhis five and a half feet high. : At Vallalaar Koil near Mayavaram, an important Dakshinamoorthy sthalam; Seated on Rishabham. : At Pattamangalam (Sivaganga)..He is seated under a 1000 year old Saal Tree. :At Thirunedungulam near Thiruverumbur, Yoga Dakshinamoorthy in Padmasana , as in Uththarakosamangai. : At ILambayankottur near Madras Right hand on His left chest. : At Thiruppoonthuruthi, sitting on Lotus & playing the Veena. : At Thingalur near Thiruvayyaru, seated with Palm leaves in His Hands. : There is a relatively new temple near the huge Anjaneya Temple, Thiruvallur. : There is also a beautiful Temple Medha Dakshinamoorthy in Theni at the Swami Omkarananda Ashram. He is so beautiful. : At Annadana Dakshinamoorthy at the Siva Temple at Thepperumanallur near Kumbakonam (originally called Devarajapuram). : At Thirunageswaram, he is near Amman Sannidhi with Thrisulam & Rudraksham in the hands behind. : At the Badami cave temple He is in the form of Ardhanareeswara, holding a Veena. *In the Tanjore Baladandayuthapani, he is with Ambal as Sakthi Dakshinamurthy. 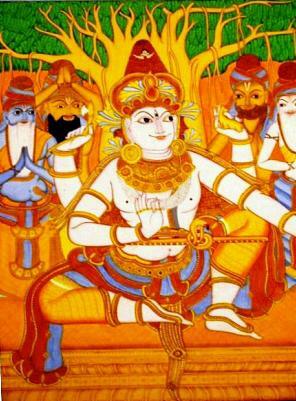 *In the Kazhugumalai Vettuvan Temple Vimana, He is there on the South side playing the Mridhangam. @sreenivasarao thank you so much for your detailed reply. In the process of seeing these temples. Hope this can be expanded to include more, in future. 2. Sri la Sri Sivagnana Desiga Swamigal, the Tenth Maha Sannidhanam of Dharmapuram has sung the praise of Lord Dakshinamurthy in ten stanzas which go by the name “Sri Dakshinamurthy Thiruvarutpa”. Further, please help me to understand/read/learn more about my craze Lord Dakshinamoorthi. I have only heard and read these: http://www.flipkart.com/sri-dakshinamurthy-stotram/p/itmd6zew653m7gr3. Would be happy if there is a compilation of reference to Lord Dakshinamoorthi as found in various ancient scriptures (like, Suta Samhita). If there is one, please help me to access it or else guide me to create it. Thank you so much Guruji…for giving me a platform and space to ask my doubts. Much blessed and obliged. Much obliged & blessed with your replies and kindly help me understand this. 1. Sri Nandhi, the bull vehicle of Lord Shiva had sung 8 verses in praise of Lord Dakshinamurthy which is recommended to devotees for prayer and chanting for relief from arrogant qualities and to attain wisdom at sri Vadaranyeswarar temple. (as in http://temple.dinamalar.com/en/new_en.php?id=456). Please help me to get that. 2. Further in the same sri Vadaranyeswarar temple mentioned above, a hymn was written on Lord Dakshinamurthi in Tamil. Please help me to get that. 3. Just wanted to know if there is any compilation available on various verses about Lord Dakshinamoorthy found in ancient scriptures (like in Suta Samhita, etc…) or else help me to compile the same. 4. 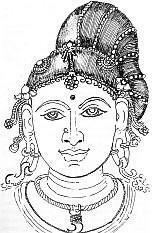 Till date I was able to hear & read only the following stotras on Lord Dakshinamurti as in http://www.flipkart.com/sri-dakshinamurthy-stotras/p/itmd6zcevbfdwz6p?pid=DGAD6ZA4HGWYGHMH…Please help me to locate more stotras on Thy. 5. 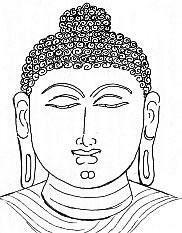 Kindly enlighten me on Brahma Sutra & its connections with Lord Dakshinamurthi; further whether Lord Dakshinamurthi and Dakshinamurthi School of thought is connected? The seventeenth paasuram of Alwar’s Thirumazhisai is another beautiful one that describes the parathvam of Sriman NaarAyaNan . Here , hedescribes the relationship between DakshinAmUrthy ( Lord SivA sitting under the pupil tree and explaining sakala–sAsthrArthams with His silence to the four rishis , Dakshar ,Agasthyar , Pulasthyar and MaarkanDeyar ) and Sriman NaarAyaNan . Am unable to trace the script of 17th paasuram in tamil. Please pardon me if my doubts were silly. Your part 1 & II of this article is mesmerizing me again & again whenever I look at it. Enjoyed & enjoying with your blessings. Dear thisisvj , I am posting below a reply received from Smt. Usha Suryamani , an erudite person in these subjects. Please follow her views. In the meantime , I shall also try. Please pardon me if my doubts were silly. I understand Internet is not the final place to search many of these. But please guide me. Dear thisisv , pardon me for the delay in responding to your questions. Sadly , my familiarity with Tamil is minimal ; and I have not read the stotras in Tamil. However , I will try to get at the translations and shall get back to you. I have also requested a friend to guide me. Lets hope it works. @Usha Suryamani ji…thanks for your dedicated reply. Me too an ardent follower of Raju’s temple visits…sure, will heed your advice. @sreenivasaraos ji…I remain obliged for you and your dedication in getting solutions for anything. Will wait for your detailed reply. As requested please help me to build a Lord Dakshinamurthi Database…I know…its not that easy but with peoples like you around, it shouldnt be impossible either. Thanks for the very deep knowledge shared about my Guru Deva!! Dear TQ, Thank you for the appreciation. Please do read the other articles too.